Comet 2011 L4 (PanSTARRS) as it will appear on the evening of 13 March, when it becomes visible to UK observers. AN graphic by Greg Smye-Rumsby. The long-anticipated comet 2011 L4 (PanSTARRS) has finally cleared the horizon and is heading north into UK skies for the rest of this month. Although not quite matching the dazzling predictions of its brightness that were forecast after its discovery, it is still a must-view object that has brightened to magnitude 0, which should be apparent to the naked eye as a fuzzy blob in the dusk twilight close to the western horizon. Thought to be arriving fresh from the Oort Cloud and experiencing its parent star up close for the first time, C/2011 L4 came closest to Earth (1.1 astronomical units distant) on 5 March and reached perihelion four days later (0.3 astronomical units from the Sun). Heading north, it is now gliding through western Cetus, traversing Pisces between 13 and 21 March, then moving through southern Andromeda for the remainder of the month. Observers based in the UK can realistically expect to follow the comet as a naked eye object between 13 and 25 March (based on a median of current predictions), at first in the evening skies in the north-west and from 21 March onwards in both the evening (north-western) and morning (north-eastern) skies. From 26 March onwards C/2011 L4 will require binoculars to be seen, and during early April it becomes circumpolar and above the horizon all night long. 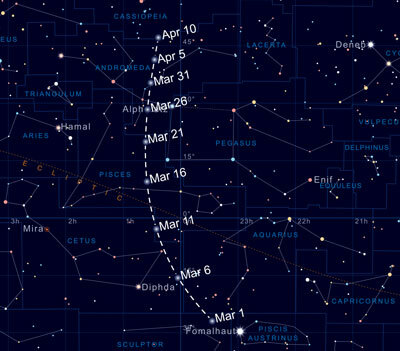 The path of comet L4 PanSTARRS as it sweeps high into the sky over the course of March. AN graphic by Greg Smye-Rumsby. When C/2011 L4 was discovered predictions suggested that at its peak around perihelion it could become as bright as Venus. However, the performance of first-time visitors found so far from perihelion is notoriously difficult to estimate so far in advance. Now that more observational data has been gathered the predictions have been downsized to magnitude 0, which is still very good indeed, rivalling the brightest stars. Given a clear western horizon, your first opportunity to attempt to find the comet in the darkening astronomical twilight takes place on 13 March, when the comet (magnitude +3.3), a few degrees high, is joined by the two day-old Moon. The thin lunar crescent lies about seven degrees north-east of the comet, almost in line with the comet's tail; both objects will be seen in a single 7 x 50 binocular field-of-view, providing a rare and beautiful sight and a great astrophotographic opportunity. By 18 March C/2011 L4 will be fading, but should have climbed sufficiently north for it to be visible above the north-western horizon by the time astronomical night begins. However, a high, ever brightening waxing Moon will tend to hamper the naked eye visibility of the comet. Perhaps one of the last times that the comet might be seen without optical aid will be on 22 March, with the ten day-old Moon high in the south at the same time. C/2011 L4 will be spectacular when viewed through binoculars or telescopes, especially when the more subtle features in its coma and tail don't have to contend with the glare of the Moon. By the evening of 30 March the comet is six degrees south of M31, the Andromeda Galaxy, making another wonderful binocular sight (both can be encompassed in a 7 x 50 binocular field) and an unmissable astrophotographic opportunity. It should be sufficiently dark to see both by around 8pm. On the morning of 31 March it will be yet closer to M31; take a look from about 4:30am BST (remember, the clock goes forward an hour at 1am). Later that evening the comet is almost five degrees closer to M31; viewing can begin at around 9pm BST, when C/2011 L4 is around 12 degrees above the north-western horizon in darkening astronomical twilight skies. 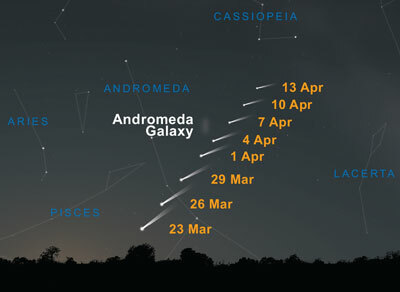 Comet L4 PanSTARRS passes close to the Andromeda Galaxy towards the end of March and into April. 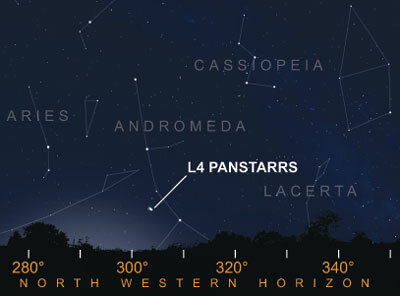 Note: PanSTARRS will likely have faded beyond naked eye observation by this point. AN graphic by Greg Smye-Rumsby. Observers based in the UK can realistically expect to follow the comet as a naked-eye object between 13 and 25 March, at first in the evening skies in the north-west and from 21 March onwards in both the evening (north-western) and morning (north-eastern) skies.